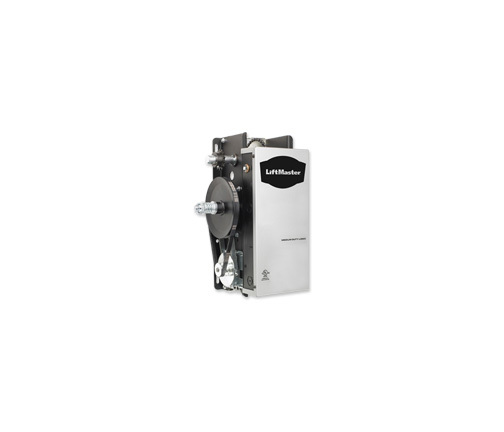 The MJ is a medium-duty logic jackshift operator featuring a compact design for use on industrial sectional doors with high or vertical lift and on small rolling doors and grilles. Programmable C2 or B2 wiring options (B2 requires installed Monitor Entrapment Protection Device) to meet business requirements for commercial door operator control. Floor-level disconnect provides emergency manual operation. Drive Reduction, first stage heavy-duty 4L V-belt; second stage and third stages #48 chain. Integrated 90 second maximum run timer. Heavy-duty solenoid actuated brake standard. Easily field converted for right or left mounting. Built-in-3-channel, 315 MHz radio receiver accepts up to (20) LiftMaster Security+ or unlimited DIP switch remote controls. 3-button remote controls can be programmed for OPEN/CLOSE/STOP operation. The MJ Operator is not recommended for use in large or high rolling doors without chain hoist modification (see Model MH). On steel-insulated doors, a 24 ga. back panel is assumed.